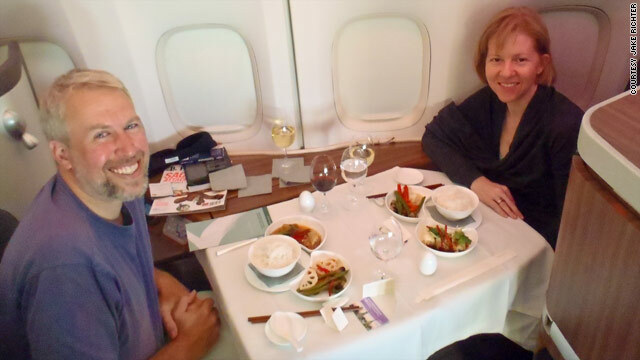 Jake and Linda Richter enjoy fine dining in first class on a flight from California to China. (CNN) -- The caviar and smoked salmon were superb, the chilled champagne flowed freely and the service was impeccable as Jake and Linda Richter gazed at each other across a table covered with white linen and set with fine china. The only thing missing was the candlelight, but an open flame wouldn't have been encouraged in this dining room cruising at 550 miles per hour somewhere over the Pacific Ocean. Sitting in first class on a recent Cathay Pacific flight from San Francisco, California, to Hong Kong, China, the Richters were dining in style. The menu included stir-fried prawns and scallops accented with tangerine peel and jasmine rice; double-boiled ginseng and lean pork soup; and an extensive wine list. "It was as if being in a restaurant," recalled Jake Richter, a U.S. businessman who lives on the Caribbean island of Bonaire. "They worked very hard on presentation. Everything was individually plated. ... It was fantastic." Most air travelers have little to be happy about when it comes to airline food these days. There just isn't any on a growing number of flights, and even when meals are served, the food rarely goes beyond bland, rubbery, starchy mystery fare. But if you splurge on business or first class -- whether spending thousands of dollars or tens of thousands of frequent flier miles for a seat -- the dining experience can be deluxe and luxurious, especially on international flights. Some airlines, particularly in Asia and the Middle East, have always been known for impressing their passengers' palates. Others have partnered with prominent restaurant chefs to send a message that they're serious about offering gourmet food for their best customers. "I like to watch people's facial expressions after they get their first bite," said Sam Choy, one of a handful of celebrity consulting chefs for American Airlines, who has flown to see how passengers react to the meals he has created for the carrier. "When they kind of rock their heads back and forth, I like that. That tells me something good has just happened." Choy, a Hawaii-based restaurateur and cookbook author, is behind some of the premium-class menus on American's routes to China and Japan. The destinations inspire the dishes, so some of his Asian-themed entrees have included a wasabi crusted salmon with a sweet papaya pineapple marmalade and a hibachi miso marinated chicken breast accompanied by brown fried rice with bacon. Luxury touches for passengers dining in the front of the plane may include saffron, truffles and Scottish smoked salmon, said Michelle Bernstein, who owns two restaurants in Miami, Florida, and serves as a consulting chef for Delta Airlines. Taste buds are less sensitive at 35,000 feet, she said, so the focus is on bringing out the food's great flavor. "I have to make it spicy, I have to make it intense," Bernstein said. "We try to give more natural reduction, more chiles, more pepper, more herbs, more spice." Her offerings in Delta's premium cabins have included a roasted chicken breast with balsamic cipollini onions and blue cheese sauce with mascarpone mashed potatoes; and cheese ravioli tossed with eggplant and artichoke caponata. When creating airline menus, chefs like Choy and Bernstein have some special restrictions. The meals must fit on trays that have to be easily stacked, so large or vertical foods like whole chickens or lamb shanks don't work. 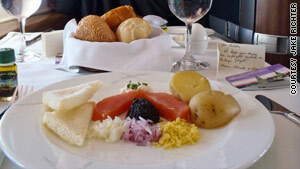 Jake Richter enjoyed salmon and caviar before his main course on a flight to Hong Kong, China. If there is turbulence that confines flight attendants to their seats, the food may sit in a reheating oven longer than planned, so it can't be something that dries out too easily. Once they work around those obstacles, the chefs put together a blueprint that contains the recipes and the presentation of the meals "to the pea," Choy said. Caterers use the plans to prepare the dishes within hours of the flight. After it's cooked, the food is blast-chilled -- or quickly cooled to about 38 degrees Fahrenheit -- and delivered on board. Flight attendants, who reheat the food, have photos and "a whole folder of notes and instructions" on what the meals should look like when served to passengers, Bernstein said. They may add extra touches, like spooning out sauce or adding a fresh garnish. By offering upscale cuisine, airlines are not only competing for first-class customers but people who might otherwise fly private, said Gary Leff, a frequent flier who lives in Arlington, Virginia, and shares strategies for accumulating airline miles on his blog, View from the Wing. But U.S. and European carriers still have a ways to go before matching the food offerings on Asian airlines, he added. Leff, who calls himself a "terrible food snob," has been impressed by the truffle risotto with actual shaved truffles served on South Korea's Asiana Airlines. He also raved about the "out of this world" Kaiseki meal -- a traditional multicourse Japanese dinner -- offered by All Nippon Airways. Then, there's the farm-fresh breakfast on Cathay Pacific. "They actually do make your eggs to order, by which I mean they'll crack the eggs," Leff said. "So it's not like here's a reheated omelet or something. The flight attendants working first class are all quite proud of their ability to make a mean scrambled eggs." Leff also enjoys the flexibility of first-class dining. You can mix and match entrees and appetizers, he said, or go with something else entirely. On a Thai Airways flight from Bangkok to Hong Kong, he special-ordered the lobster Thermidor for breakfast instead of opting for the usual morning offerings. And of course no first-class dining experience would be complete without an extensive and premium alcohol selection. Leff seemed to know the champagne offerings of some airlines by heart: ANA serves Krug, Singapore Airlines offers both Krug and Dom Perignon, while Asiana has Taittinger. The shopping list to make this kind of dining happen would impress any connoisseur. Last year, American Airlines bought 215,000 cases of wine and in a typical month, Delta will serve almost 8,000 bottles of champagne, 45,000 pounds of beef tenderloin and 30,000 pounds of smoked salmon. It all comes together to create a memorable experience for passengers. Jake Richter still marvels at the gourmet meal he shared with his wife over the Pacific. "It really didn't feel like flying, it was just like being in a comfy location for 14 hours and just being pampered thoroughly," he said.